The content of a state space report is set by changing the options for the Save state space report tool. To change the textual format of place and transition names, see “Setting string representation options” below. The string representation options allow the user to specify how the st-functions (which are fully described in the state space tool manual) will work. The st-functions are used for the standard reports generated by the Save state space report tool. Hence, changing these options also influences the state space report. To set a string representation option, create an auxiliary text containing the appropriate string-representation functions described in the manual, and evaluate the function using the Evaluate ML tool. Next, we show an example of how to change the string representation of place instances in the state space tool. Evaluating the top auxiliary text shows the default string representation for the place Think on the first (1) instance of the page named Page in the example CPN for the Dining Philosophers example. Evaluating the middle auxiliary text will change the string-representation function for place instances. 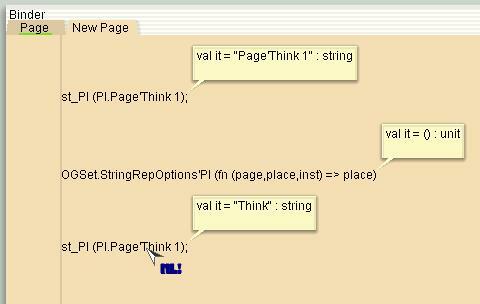 Evaluating the bottom auxiliary text shows the new string representation for the place Think. The stop options allow you to determine when the calculation of a state space stops. This happens when all nodes have been processed or when one of the stop options is satisfied. The branching options allow you to specify that, under certain circumstances, the state space tool does not need to calculate all successors of a node. The node is then said to be only partially processed. The stop and branching options are changed by changing the options for the Calculate state space tool. For more information about stop and branching options, we refer to the state space tool manual.